Pirates League - Pixie & Pirate Destinations *|* Wishes become memories. One dream at a time. 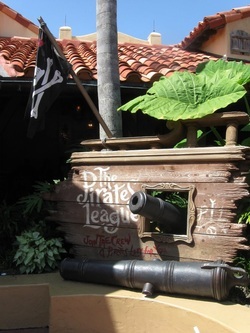 During my family's visit to Walt Disney World® Resort in August 2011, I decided to surprise my youngest son with a trip to the Pirates League in the Magic Kingdom. And what an experience it was! He loved it and had a great time being transformed from a normal 5 year old to a swashbuckling pirate. When you first arrive and check in at the Pirates League, located conveniently near the Pirates of the Caribbean ride, there are pirates and wenches that greet you. You then get to choose which pirate makeup you'd prefer. There are many choices for both boys and girls. Next up is your pirate name. My son was given a pirate name that he cannot pronounce, but made us laugh nonetheless - Bartholomew Stormwater. We even have a certificate with his name saying that he's now an official pirate. After a short wait inside the "makeover" room, he was called to sit in a barber shop style chair where he was officially transformed. The pirate/scallywag who did his makeup was very nice and continued to talk and joke with us as he did my son's makeup. Soon enough we had a small pirate on our hands! Bartholomew Stormwater was required to take the "pirate oath", which contained a lot of big words and phrases and was meant to be fun and silly. He raised his little right hand and stumbled his way through. Wearing his new "Pirates League" sash, bandana, gold earring, freshly painted black eye, and carrying a toy sword - Bartholomew was taken into a small library where we met another pirate who took his picture and gave him a secret pirate coin necklace. When I'd made the reservation for the makeover I didn't realize they would take a picture but when I saw how good it turned out I had to purchase it. This was probably a once in a lifetime experience and the picture is pirately perfect. Throughout the day at the Magic Kingdom we walked around as a family with a small pirate following us everywhere. Cast Members pretended to be afraid and in awe of his pirate self. Passersby would randomly say "Arrggh" or "Ahoy matey!" And even Minnie Mouse got in on the action when we went to meet her later in the day. As Bartholomew walked up to her so that mom could take a picture, Minnie put her hands over her face and hid behind Mickey. Bartholomew responded as any noble pirate would - he laughed. And then hugged her. The Pirates League is a great place to visit during your next Disney World vacation - and even on the amazing Disney Fantasy cruise ship. It's fun, inexpensive and memorable. Ahoy!